Dar es Salaam (CNN) - President Barack Obama will meet with former President George W. Bush Tuesday morning in Tanzania, where they'll both attend a wreath laying ceremony commemorating the U.S. Embassy attack in Dar es Salaam, White House Press Secretary Jay Carney announced on Air Force One. Talking about their upcoming meeting, Obama said Monday it will be a chance to talk about the President's Emergency Program for AIDS Relief, an aid program started by Bush during his first term. "This is Bush's crowning achievement," the president said at a press conference. "Anti-retroviral drugs give people a decent life." Obama also responded to critics who say his administration has not focused as much on PEPFAR as his predecessor. "We're serving four times the number of people today than when PEPFAR first began, but we're doing it at reduced costs, and we're reinvesting the savings in other health initiatives," he said. "This indicates how timely PEPFAR was, and the bipartisan support that we've received has been extraordinary. And President Bush played a big role in that." The Tanzania bombing, which occurred on August 7, 1998, killed 11 people and wounded hundreds. On the same day, a separate blast at the U.S. Embassy in Nairobi, Kenya killed more that 200 people and wounded close to 5,000. Obama and his predecessor are not expected to make remarks at the event. 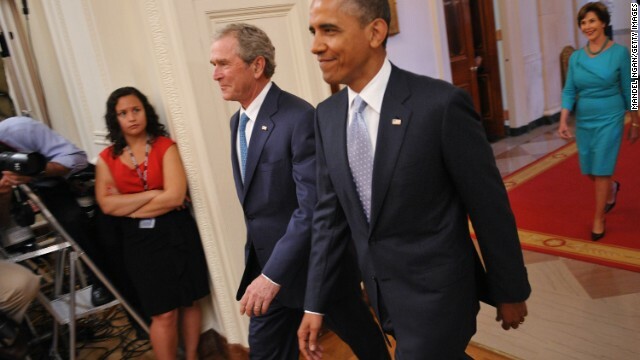 Bush and Obama were last together in late April during the 43rd president's library dedication ceremony in Dallas. Obama and the first lady conclude their three-country trip to Africa–which also included stops to Senegal and South Africa–tomorrow. Bush has been in Zambia to help renovate a clinic that serves as a cervical cancer screening and treatment center. The first ladies are scheduled to attend the African First Ladies Summit, put on by the George W. Bush Institute, in Tanzania on Tuesday. - CNN White House Producer Gabriella Schwarz contributed to this report. Interesting these two and their 'President club' relationship. Interesting. I really admire these two different families. They are showing a good axample of: One Nation, One People. Keep it up. What you are doing and showing, really shows how people who belong to one nation should behave. Very encouraging. The 2 worst Presidents in US history visit Tanzania. What joke.